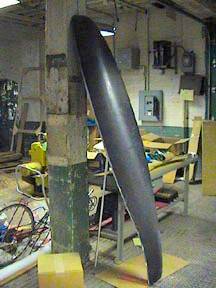 I recently bought the molds for the Varna/Buttemer from George Georgiev and have embarked upon an effort to produce a half dozen GeeBee Varnas for the next HPRA racing season. This is part of my effort to expand the number of streamliners in our series. 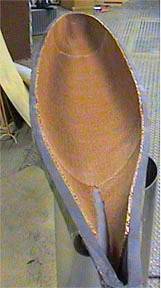 areas of the bubble to avoid excessive thinning. I use quartz radiant heaters for this purpose. This is the female mold for the canopies. It has a neoprene gasket around the perimeter, and a vacuum fitting on the bottom. 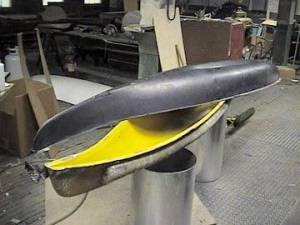 Place the piece of plastic on the gasket, and clamp a rim retainer to the mold. 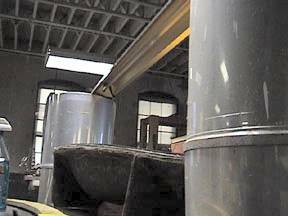 As the plastic is heated, air will be removed in the mold and atmospheric air pressure will form the plastic into the mold. 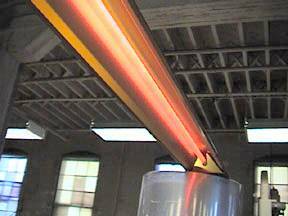 The quartz infrared heater is suspended above the mold about 18 inches. Then the heater is turned on. 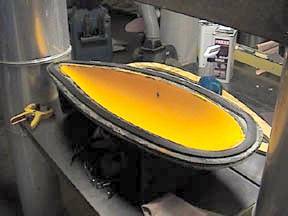 With radiant heating of the plastic, it only takes about three minutes for the plastic to come up to forming temperature. I then pulse the vacuum pump and form the plastic. The heat is turned off, the plastic cools down for two minutes, open the clamps, and VOILA! One bubble, approximately 32" x 11" wide x 8" deep. The plastic is .060" stock with minimum thickness of 045" at the top. structural, and is thus the frame of the vehicle. 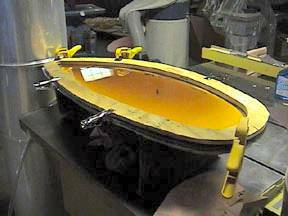 This tub then is used to mount the various subassemblies like wheels and drivetrain, seat, suspension, and top half of the fairing. 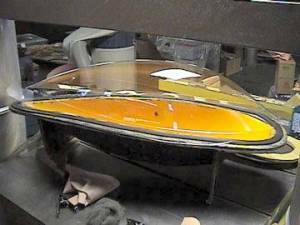 With the GeeBee I�ll start with this tub. I have two oriented layers of 10.3 oz. 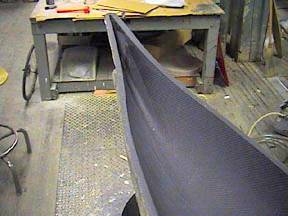 intermediate modulus carbon fiber cloth placed in the bottom mold. After doping the cloth with epoxy, I vacuum bag the entire lot to consolidate the fiber and remove the excess epoxy. 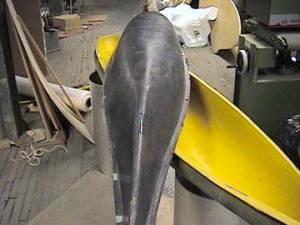 This will yield an extremely dense and strong canoe shape. 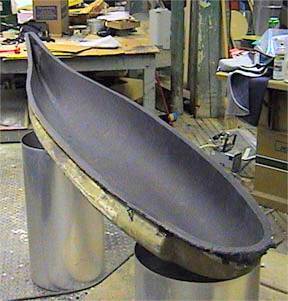 A side note here which will be affirmed by all streamliner builders........ getting the vacuum bag to seat into the tight compound curves of the nose and the tail can be a real challenge. I always find myself tensing up when debagging fairing in these areas. Did everything work? Did the bag tuck in properly? Is everything going to be a bunch of scrap? In this case, everything worked. 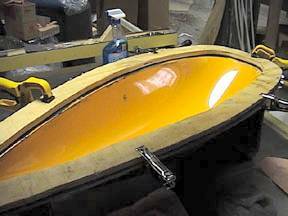 Here�s a few shots of the skin of the tub pulled out of the mold. Strong, light, but not nearly strong enough. The next step is to core the structure. 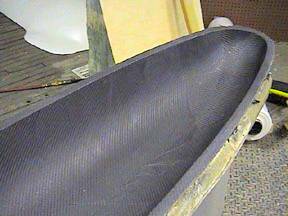 Here you see the shell back in the mold and a layer of .200 Nomex honeycomb glued in place. When another two layers of carbon are bonded to the top of the Nomex honeycomb, we will have a structure which approximates the strength of solid carbon fiber .200 thick! But not the weight of that thickness.